Trying to choose just 5 favourite hikes from among the many that we tackled in this stunning valley is a daunting task. All of the many and varied hikes we tackled in Val d'Anniviers, which you can read about here, were beautiful and invigorating in their own ways. However, if you only have a few days to explore the hills of this pristine valley, below are our favourites to give you a few ideas. Starting in Zinal (1672m), the ascent to the Cabane du Grand Mountet (2886m) is a very challenging route high above a glacial debris field that extends right into the heart of the Grande Couronne at the head of Zinaltal. After the stiff climb and several precipitous traverses we rounded a corner to find one of the most impressive glacial ice flows we've ever seen, with several individual flows coming together before sweeping off down the valley. A strenuous but very rewarding route. Anyone wanting to visit the area but on a shorter trail could also consider the considerably less demanding walk to the Cabane du Petit Mountet (2142m). Cabane de Becs Bosson sits in the hills high above the Val de Moiry at close to 3000m. It commands an amazing view of the five 4000m peaks that make up the Grande Couronne (Weisshorn, Bishorn, Zinalrothorn, Obergabelhorn and Dent Blanche) plus a host of other high mountains. It was a clear day when we visited and we could even see as far as Mont Blanc! Our route, a loop from the cable car station at Bendolla 2150m (accessed from Grimentz), was moderately challenging with just a few steep sections as we ascended almost 900m to the cabin. Bella Tolla, at just over 3000m, is a beautiful peak on the eastern flank of Val d'Anniviers that gives great views over the Bernese Alps to the north and the glaciated sides of Weisshorn in the south. Accessed from the Tignousa station after taking the funicular from St Luc, this rocky ascent is relatively easy to follow but still had snow near the summit even at the end of summer. We turned this into a circular loop, descending down the southern side of the summit. Another fantastic cabin walk from Zinal (1672m). Cabane D'Arpitettaz nestles at the base of the Glacier de Moming which flows down from the ridge connecting the summits of the Zinalrothorn (4221m) and the Weisshorn (4505m). The lower section of this walk is the same as the route to Cabane du Grande Mountet, but branches off at around 2000m before ascending sharply to the Cabane d'Arpitettaz on a relatively easy to follow track in a stunning glacial valley. The Glacier de Moming, which is visible for most of the higher sections of this hike is stunning. 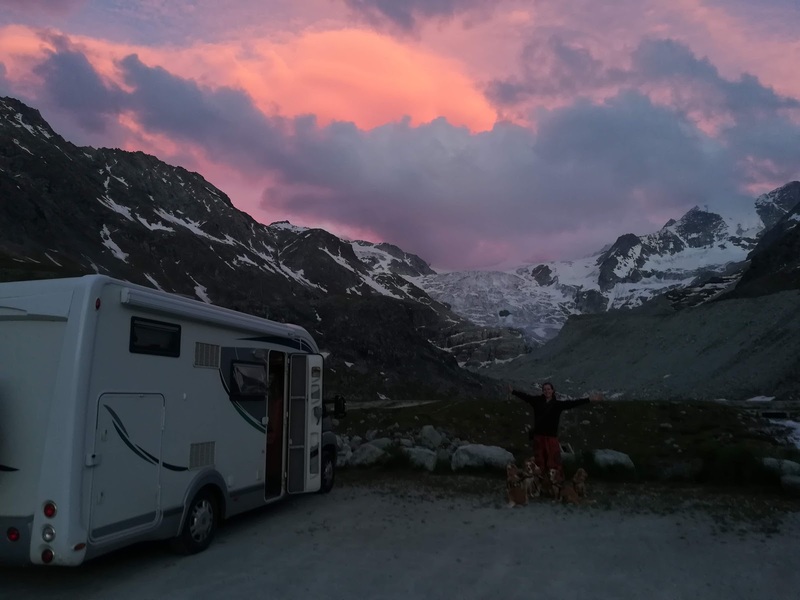 After catching the bus to Moiry Barrage (2250m) (which can in Summer be accessed from almost all villages in the Val d'Anniviers via the excellent public transport network) we originally had another destination in mind but were very grateful to have changed our plans. The ascent from the barrage gives spectacular views right along the Moiry reservoir to the Glacier du Moiry. At around 2400m we reached a col with a rough track on our left signposted Scex de Marenda which we followed. At the top we discovered an incredible ridgeline that jutted out high above the Val d'Anniviers and revealed all of the highest peaks with views stretching right across to the Bernese Alps.